Final judgments through stay order? The reinstatement of Chief Justice Sushila Karki from her suspension is a case of judicial order superseding parliamentary prerogative. Without a doubt, the parliament can impeach the chief justice. Article 101 (2) of the new constitution has a provision for impeaching Chief Justice, Supreme Court Justices and heads and members of various constitutional bodies if they are involved in serious violation of constitution and laws, or for incompetence, violation of code of conduct and for immoral activities. But the impeachment motion lodged against Karki on April 30 was a case of attack on the independence of the judiciary and encroachment on its functional autonomy. The motion was lodged on flimsy grounds. MPs could not prove she had accepted bribes or was involved in corruption. Nor could they prove she had breached code of conduct. They had lodged the motion just to punish her for her verdict on appointment of Inspector General of Police. She did not approve the appointment of the politicians. Evidently, they had not expected Karki to reject the appointment. Impeachment is not a new tool. MPs had registered a similar motion against then CIAA Chief Lokman Singh Karki in October last year. But he had been removed from office by the Supreme Court before the impeachment process could proceed in parliament. The tussle between judiciary and parliament this time, however, has set bad precedent. It may have a direct impact on rule of law, independence of judiciary and parliamentary prerogative. There is a debate as to whether restoration of Chief Justice Karki five days after her suspension has helped uphold constitutionalism, rule of law and independence of judiciary. Justice Cholendra Shamsher Rana’s single bench decided that the parliament had interfered with a judicial function and directed the parliament not to proceed with the impeachment motion. All three organs of the state need to exercise restraint. Each organ needs to honor the principle of separation of powers and checks and balances, according to which state organs should refrain from encroachment into each other’s jurisdictions. Definitely, the government may argue that the apex court encroached on the executive’s powers on IGP appointment. But this was a case of dispute among IGP contenders and Supreme Court was the right authority to review the appointment process. 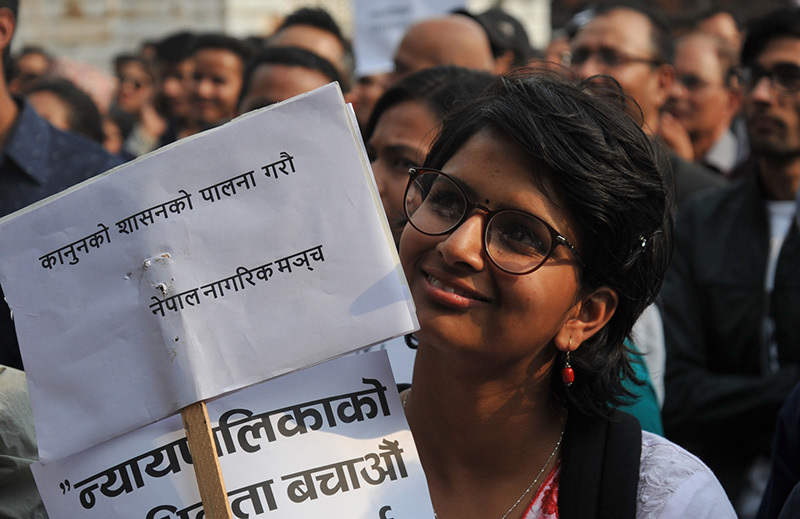 In Sushila Karki’s case, the apex court has decided that the lawmakers had framed invalid charges against her while filing the motion. After her reinstatement, political leaders have a few alternatives: impeaching judges again, resigning on moral grounds or seeking public apology for unnecessarily dragging the judiciary into controversy. They are unlikely to go for the second and third options, if their past track record is anything to go by. The Supreme Court order in response to public interest litigation (PIL) filed by advocate Sunil Ranjan Singh challenging the impeachment motion against Chief Justice Karki has created a serious dilemma before the government and the parliament. They cannot decide whether or not to proceed with the motion because, on one hand, there is parliamentary privilege to do so as per Article 103 of the constitution. But, on the other, the apex court has asked the parliament not to press ahead. The lesson is: state organs should exercise maximum self-control when it comes to impinging on the rights of one another. Otherwise, there will be a tussle among state organs, which in turn will be harmful for the democracy. It is true that the constitution has granted the power of impeachment to the parliament. But if such power is not used wisely, it can create conflict between parliament and judiciary. Supreme Court order has clearly communicated this. The Supreme Court has stored judicial independence and taught political parties a harsh lesson. But there is no guarantee that political parties won’t again resort to this weapon to remove those they don’t like from important constitution bodies. Abusing the right of impeachment won’t help with parliamentary ‘supremacy’. Instead, it could erode even the little faith the public still has on the institution. What is touted as ‘parliamentary prerogative’ is nothing but freedom of speech and right against arrest of lawmakers during parliament sessions. It does not in any way mean exerting control over other organs of the state and encroaching upon functional autonomy of organs like the Supreme Court, CIAA, Election Commission and other such constitutional bodies. Parliamentary prerogative does not allow lawmakers to raise questions on sub-judice cases. The impeachment motion against CJ Karki has boomeranged. The charges filed against her have been disproved. The bold verdict by Justice Cholendra Shamsher Rana has restored judicial independence. The verdict has shown that judges of the Supreme Court are competent, independent and courageous. But the long-term implication of this decision remains to be seen.